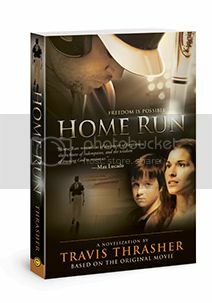 I've recently had the chance to review a new book by Travis Thrasher, Home Run. This is the novelization of a movie that is coming out in April. April 19, to be precise. Confession time. This book arrived and I stared at it, wondering what in the world I was thinking. I mean, I enjoy a good sports movie and all, especially one that has a theme of healing and redemption. But a book? Why do I do this to myself? Last night, I grabbed the book off the shelf, as I promised a review by today. I figured I better at least start reading, and I hoped I'd get hooked. The opening scene has two little boys playing with baseball cards in the barn. Enter an abusive dad, and the big brother trying to protect his little brother... and, well, I wasn't hooked. But I did care about these hurting baby boys (ages 8 and 4). Baseball star Cory Brand knows how to win. But off the field, he's spiraling out of control. Haunted by old wounds and regrets, his future seems as hopeless as his past. Until one moment-one mistake-changes everything. To save his career, Cory must go back to the town where it all began. His plan is simple: coach the local baseball team, complete a recovery program, and get out as fast as possible. Instead, he runs headfirst into memories he can't escape ... and the love he left behind. Faced with a second chance he never expected, Cory embarks on a journey of faith, transformation and redemption. And along the way, he discovers a powerful truth: no one is beyond the healing of God. A novel based on the major motion picture starring Vivica A. Fox and Scott Elrod, Home Run is an inspirational story of the hope and freedom God offers each of us. Cory may be the protagonist, and he may have had some admirable qualities as an 8 year old, but his grown-up self is arrogant and totally self-absorbed. He's quite the victim. A very believable victim. And wow, you do feel for him, and for those around him as well. Having read the publisher's blurb, I had a pretty good idea as to how things would turn out, but the characters made it so that I wanted to know the details, and there were certainly a few twists that I hadn't quite foreseen. I will see this movie. I loved this book... and you could have one too, as I have a copy to give away! Oh my- the last baseball game I watched was over 20 years ago when I went home from college with a friend for the weekend and we watched a professional game in her hometown. Baseball! Does little league count? That was probably 10 years ago. I saw the Reds play probably 15 years ago. My last baseball game (Little League) would've been last summer, but our first one for this year is on Saturday.